ZipBooks helps you to create a professional company image, including beautiful invoices, estimates, and reports. You can customize your design with your own logo and colors. 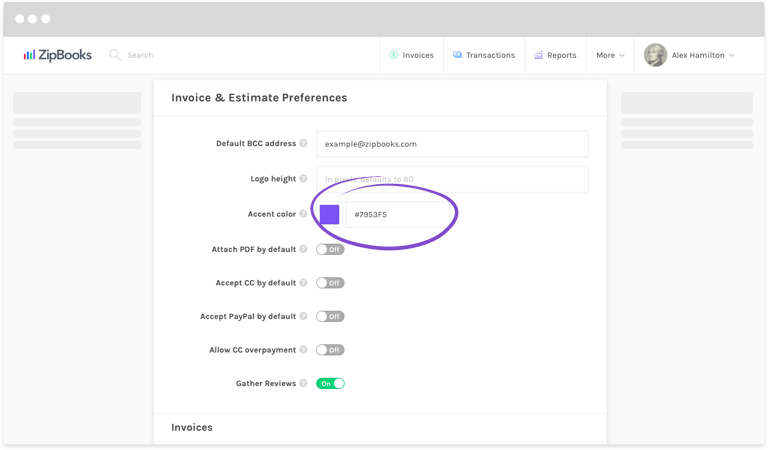 The accent color you choose for your account will be the color that appears in the top and bottom bars on your invoices and estimates. You’ll want this to be one of your main company colors– something that coordinates with your logo. Log in to ZipBooks and click on the More tab at the top of the screen. Click on Preferences under the purple Account section. If you know your color code, enter or paste it into the Accent color field. If you’d like to choose a color, click on the purple box (or it will be another color, if you’ve previously chosen a different one) and click along the color line that appears until you find the color you need. Now all of the documents you produce for your customers will be highlighted with the color you chose.